Race reports, results, championship points from all three classes. 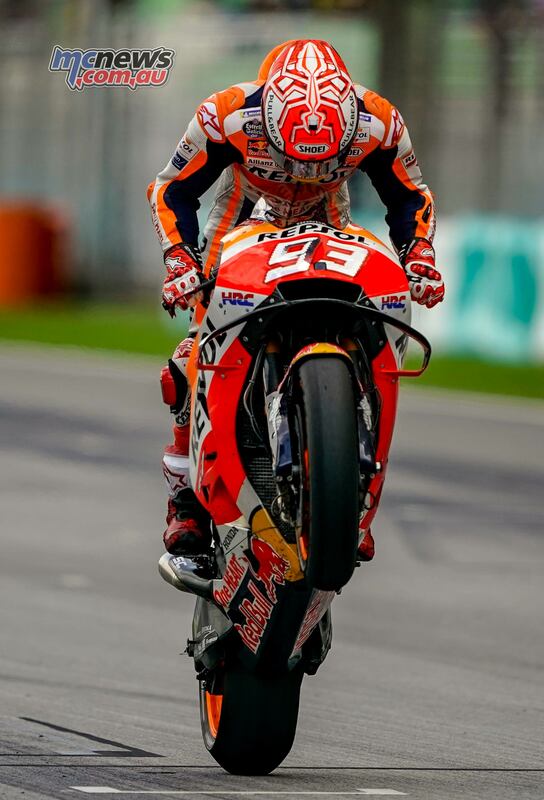 Marc Marquez (Repsol Honda Team) claimed his 70th career win after taking victory at the Shell Malaysian Motorcycle Grand Prix. The 2018 Champion looked set to lock horns with nine-time World Champion Valentino Rossi (Movistar Yamaha MotoGP) in the final stages, but the race would end in disaster for ‘The Doctor’ as he crashed out with four to go. 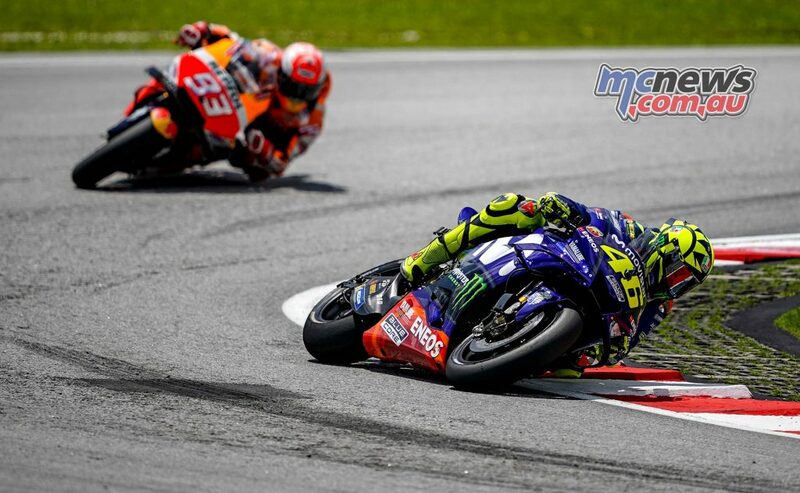 When the lights went out it was Rossi who got a stellar launch from P2, with pole man Zarco slightly sluggish off the line and ‘The Doctor’ getting a comfortable holeshot ahead of the the Frenchman, who managed to brake late to slot into P2. 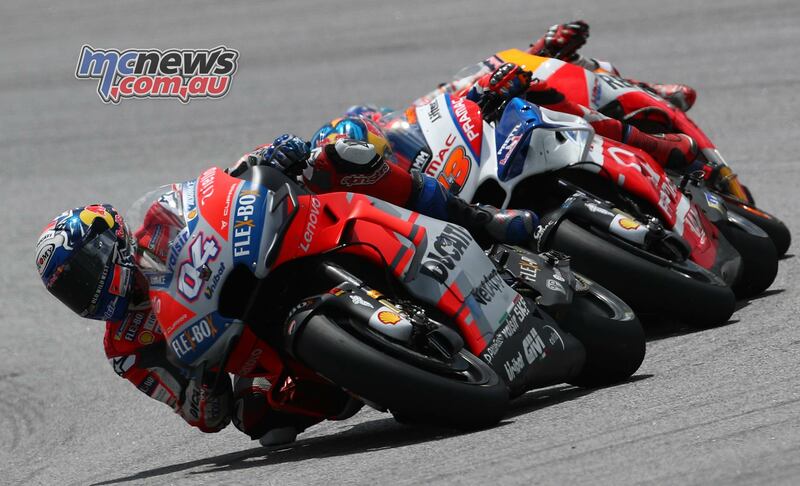 Jack Miller (Alma Pramac Racing) was able to leapfrog Andrea Iannone (Team Suzuki Ecstar) into P3 at the start, with Marquez making up one position into P6. 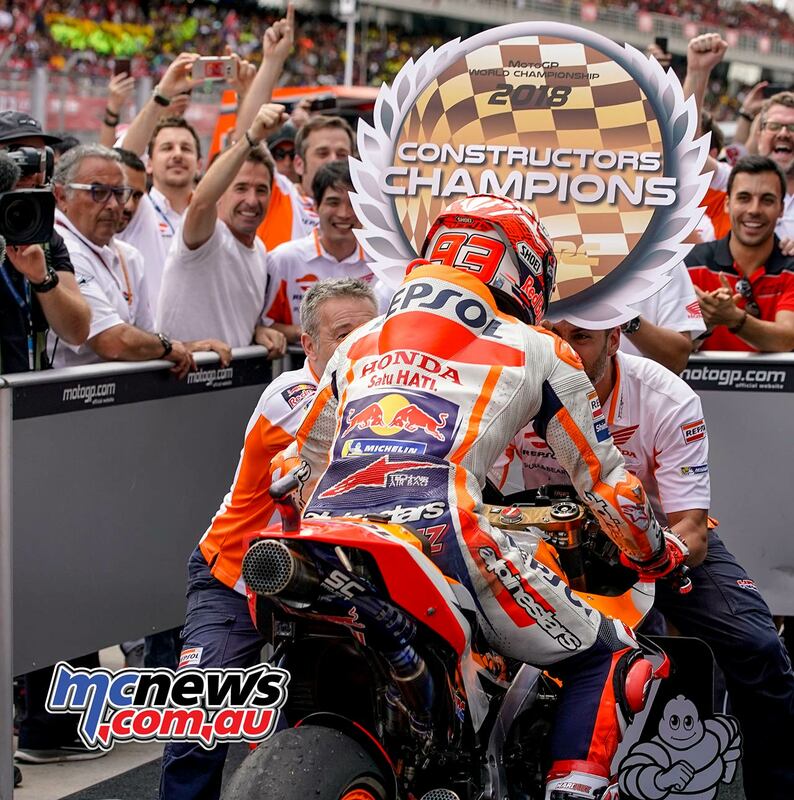 The premier class riders then settled, but this came after Marquez and teammate Dani Pedrosa (Repsol Honda Team) exchanged paint on the opening lap. 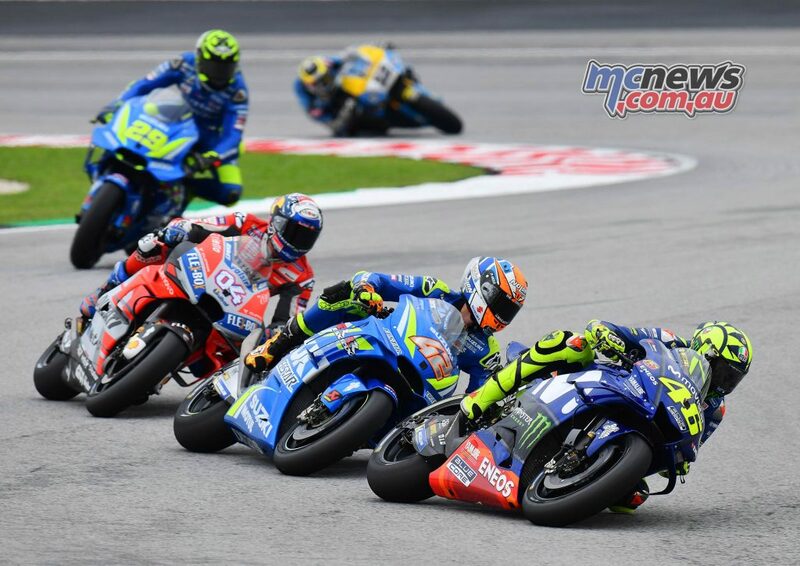 The 2018 Champion would soon start to make his way forward though, despite a hairy last corner moment at the end of the opening lap that led to Iannone crashing out directly behind the seven-time Champion. 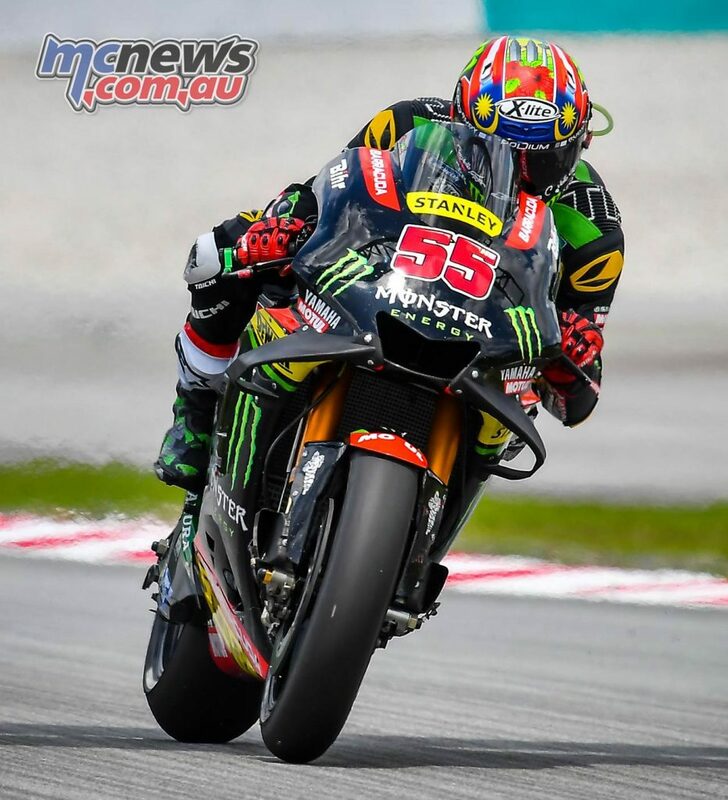 Angel Nieto Team’s Alvaro Bautista was P7 in his penultimate MotoGP race and he led fellow Desmosedici rider Miller as the Australian slipped down to P8 after a good start. P9 was his teammate Danilo Petrucci, but arguably ride of the day went to a certain Malaysian: Hafizh Syahrin (Monster Yamaha Tech 3). Starting P23, the home hero was able to get a stunning start as he got himself up to P12 on the opening lap, eventually claiming P10 to close Franco Morbidelli (EG 0,0 Marc VDS) down in the battle for ‘Rookie of the Year’. 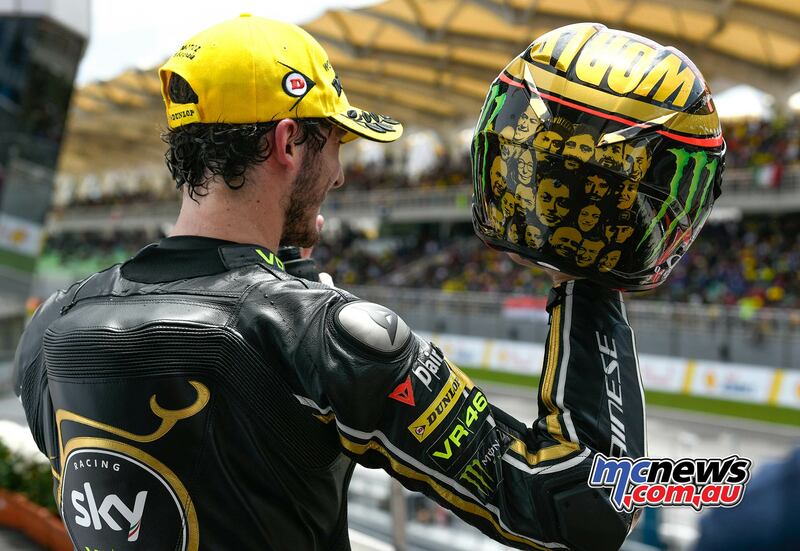 Emotional before and after the race, it was the first time a Malaysian had ever competed in the premier class and Syahrin marked the occasion in style – even heading out onto the main straight to throw his gloves into a deservedly adoring crowd. A scorching encounter in Sepang ends with Marquez on top once more, with Rossi left to ponder on what could have been. Valencia in a couple of weeks’ time brings to 2018 Championship to a close. 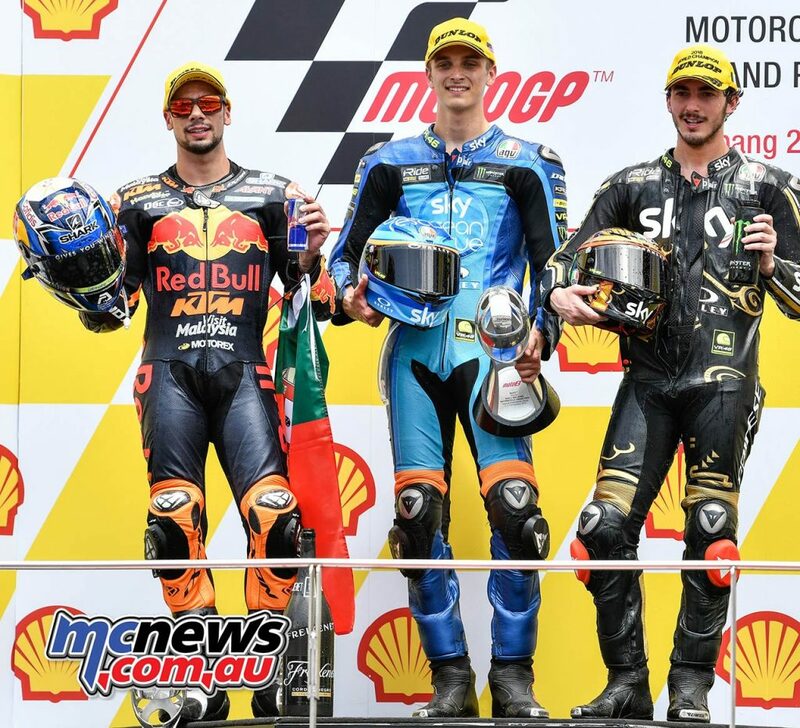 Francesco Bagnaia (Sky Racing Team VR46) clinched the 2018 Moto2 World Championship at the Shell Malaysia Motorcycle Grand Prix after finishing P3 at Sepang, with title rival Miguel Oliveira (Red Bull KTM Ajo) just up the road in second. 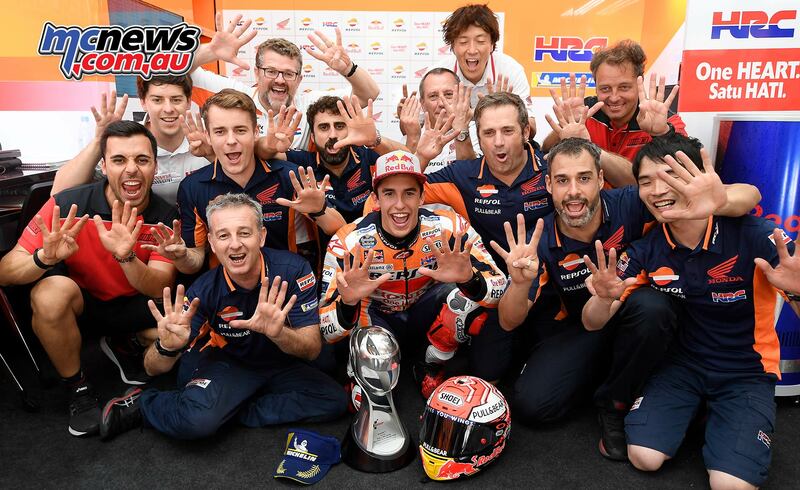 Bagnaia’s teammate Luca Marini made it an even more memorable day for Sky Racing Team VR46 as he secured his maiden Grand Prix victory in style after coming so close on a number of occasions. 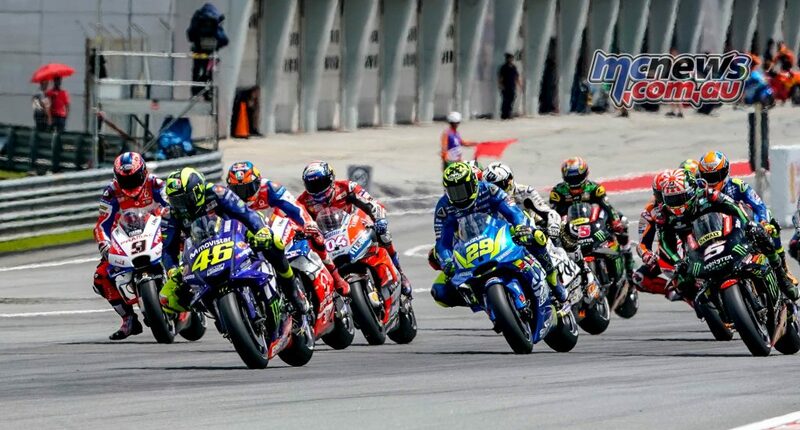 As the chequered flag was waved it was double delight for Sky Racing Team VR46 as Marini took a magnificent maiden Grand Prix victory, with Bagnaia coming home third to seal the 2018 Moto2 World Championship. Oliveira didn’t go down without a fight as he took P2 at the Sepang International Circuit – and his 11th podium of the season, but it wasn’t quite enough. Remy Gardner looked set for a top six finished until a crash with thirteen laps to go. 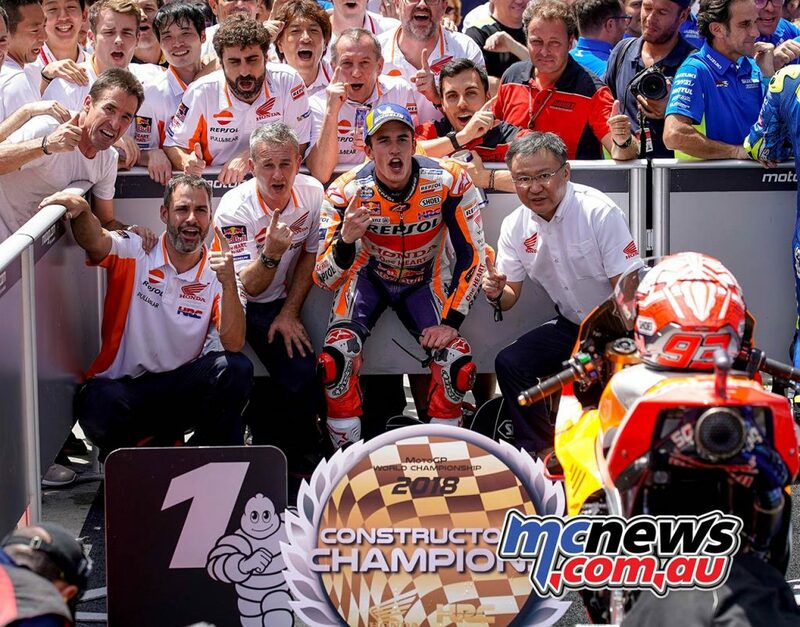 Just like the lightweight class, the 2018 intermediate class crown was decided in Malaysia and it went the way of ‘Pecco’. A stunning season for the Italian, with teammate Marini continuing his fantastic 2018. 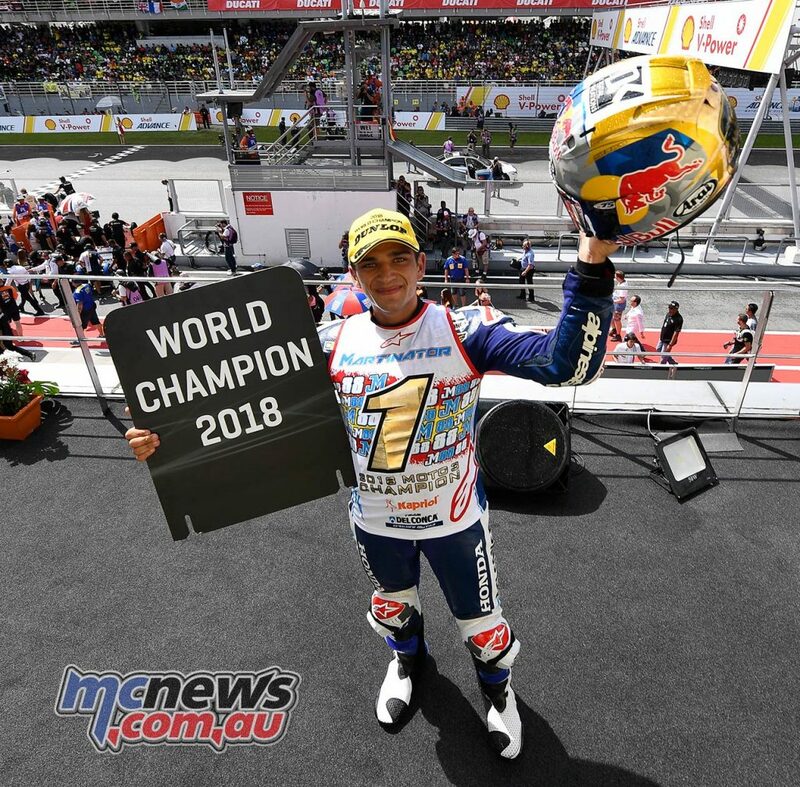 Jorge Martin (Del Conca Gresini Moto3) was crowned the Moto3 World Champion at the Shell Malaysia Motorcycle Grand Prix after claiming a stunning Sepang International Circuit victory, with main Championship rival Marco Bezzecchi (Redox PruestelGP) slipping down to P5 on the final lap to hand the title to the Spaniard. 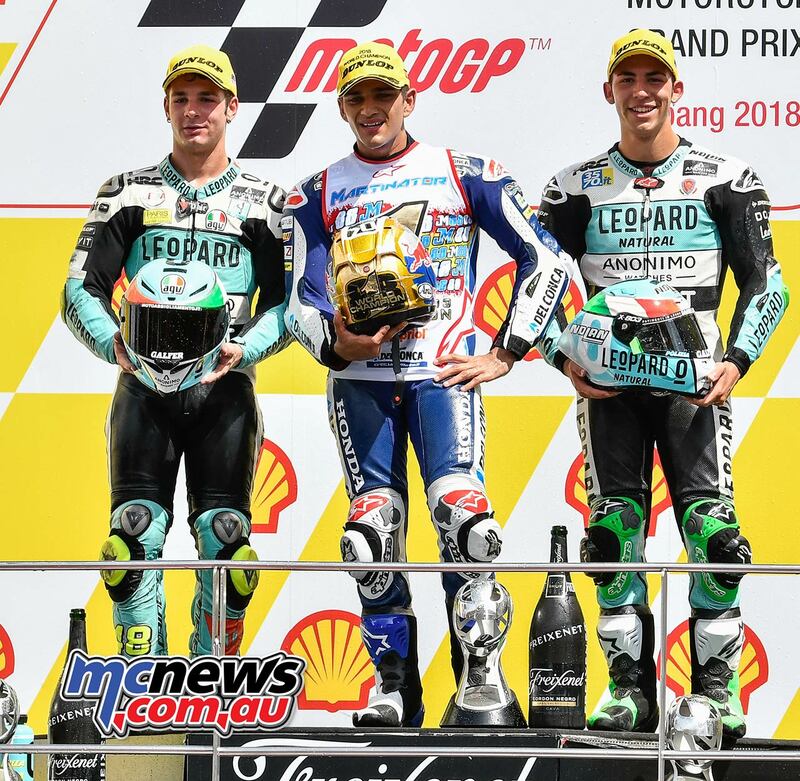 Leopard Racing teammates Lorenzo Dalla Porta and Enea Bastianini completed the podium after another hard-fought contest in Malaysia. On the prowl behind Bezzecchi were a gaggle of hungry Moto3 riders. 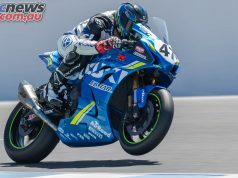 Di Giannantonio, Dalla Porta, Arbolino, Albert Arenas (Angel Nieto Team), Tatsuki Suzuki (SIC58 Squadra Corse), Enea Bastianini (Leopard Racing) and Binder were all there in the hunt for P2. 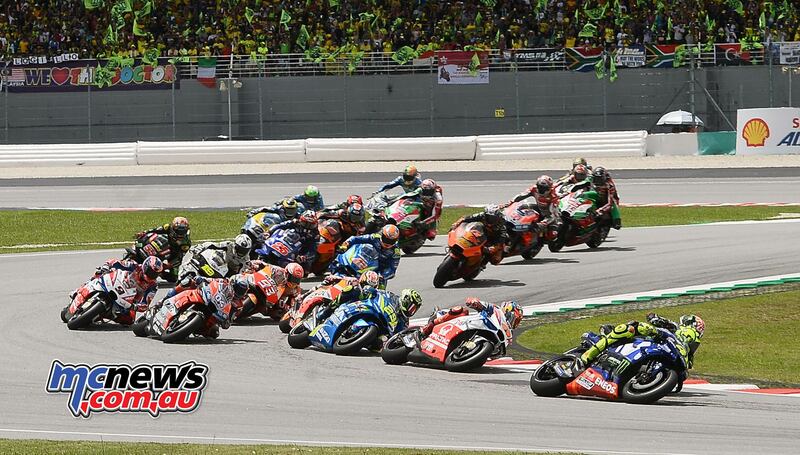 The last lap started and at Turn 4, Bezzecchi was out on the curb and down to P5 – a Championship losing position. Could the Italian recover? The answer was no, Bezzecchi pushed all he could but would cross the line P5. Despair for the Italian, and jubilation for Martin who took the victory by an impressive 3.5 seconds. Dalla Porta crossed the line in P2 for his fifth podium of the season, with teammate Bastianini recovering in the latter stages to grab a podium that means he becomes the most successful Moto3 rider in history on rostrum count. 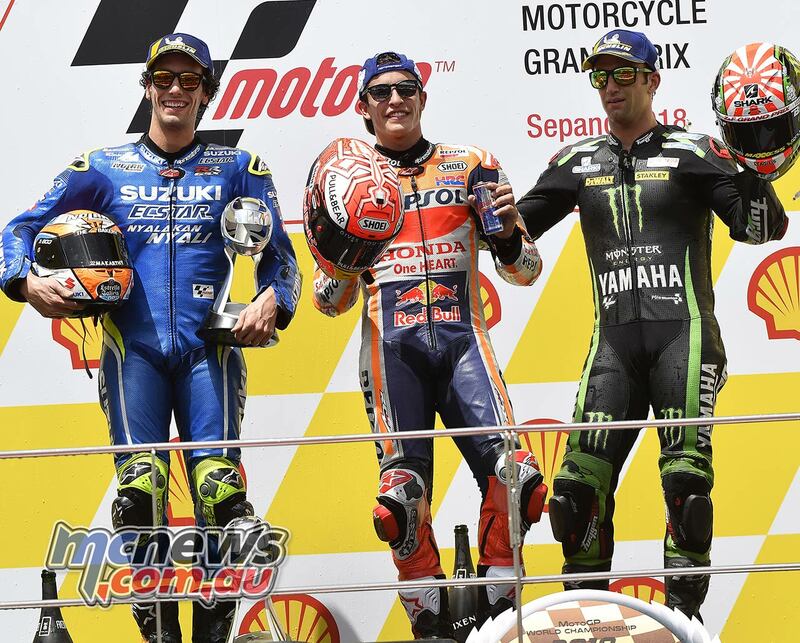 Australian GP winner Arenas missed out on a podium by 0.038, with Bezzecchi pipping ‘Diggia’ on the line – and the duo now have P2 in the Championship to fight for in Valencia. Binder ended the race in P7, Arbolino was eighth, Suzuki P9 and teammate Niccolo Antonelli securing a top ten on his return from injury.